As I finish up my final seminar of class work with Norwich University's Military History program, I have begun to mentally shift gears towards the subject matter of my final paper, where I'm going to be examining the role in which warfare helped to influence the comic book industry around the time of the Second World War, a subject that has long fascinated me. While looking around for materials, I have been thinking a lot about comic books and their subject matter in a more abstract sense - the dual role of the hero and villain in society, and as such, I believe that comic books tell some of the most elemental stories, which helps, I think, to account for their appeal to a wide range of readers around the world. There is a basic appeal to superheroes - the abilities especially - when I was a young child in Elementary School, I idolized the X-Men, because I loved what they were able to do, whether it was super strength, claws, flight, plasma beams, and so forth, and much of the deeper meanings behind some of the stories were lost on me until much later. The central meaning behind each story, I think, is of the hero, whom we are meant to emulate, but what I have come to be more interested in lately is the complicated nature of the hero and villain, and how one is inseparable from the other. This thinking comes at an interesting time. Over the past couple of months, I have been reading about a rise in costumed vigilantism across the United States, dedicated civilians who are attempting to right wrongs that they come across. These individuals, most likely heavily influenced by repeated viewings of the recent Batman films and other comic book fare, take to the streets, their faces covered, to take on crime. I have to admit, I see the appeal in this sort of thing, and I've often wondered, if I was in somewhat better shape, how I would go about this sort of thing. Fortunately, Vermont is not awash in crime, overrun by gangs and drugs, so my services will likely remain dormant for now. Interestingly, and unsurprisingly, the rise of this fad seems to prove a point about the existence of heroes - with their rise come their counterpart, the villain. Utilizing YouTube and Craigslist, an anti-heroes group, R.O.A.C.H., has formed, offering a ten dollar bounty for the identity of one of the heroes operating out of Ohio. "You won't kill me out of some misplaced sense of self-righteousness. And I won't kill you because you're just too much fun. I think you and I are destined to do this forever." 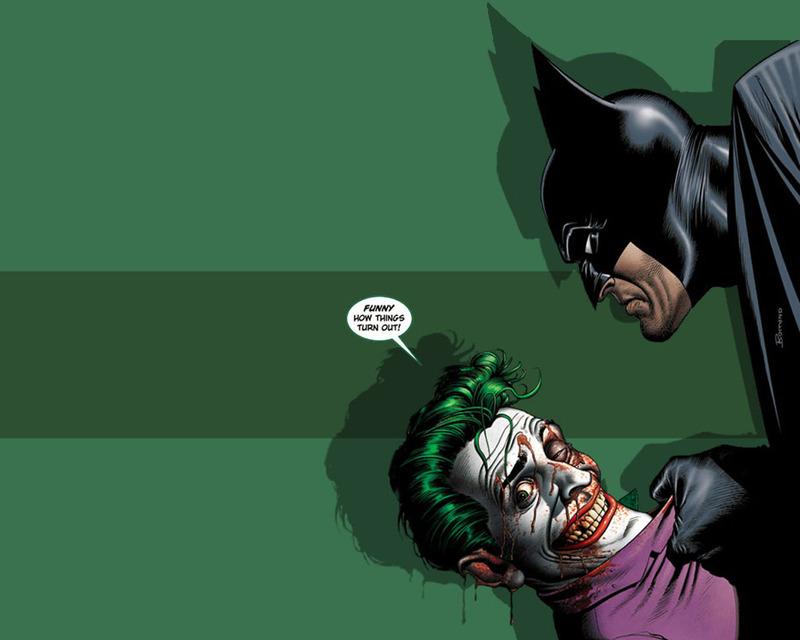 Essentially, the point that the Joker makes in the film is that where Batman is the force for a form of justice and order, he exists as a sort of counterpart, a ying and yang sort of effect. The same idea is applied to the character of Harvey Dent, who epitomizes the theme of duality. DC comics see this sort of theme between heroes as well, especially when one considers the personalities of Batman and Superman. While both are arguably forces for good, they represent two very different thought processes. Batman is a vigilante, whereas Superman seems to adhere to a far more strict ethical code. Essentially, one represents chaos and righteousness - the damaged man who has no powers to speak of - and the other represents law and order - the man who is invulnerable, godlike. While we are on the subject of Superman, we once again turn to the iconic villains, and Lex Luthor is arguably one of the main counterparts in his life. Where Superman often relies on feats of strength, righting wrongs in a purely physical manner, Luthor is much the opposite - he has no powers, but is able to counter Superman through his intellect alone. Here, major themes such as obedience and curiosity come against one another, and the realm of comic books are opened to a far greater realm. Duality is an enduring human condition, one that is completely ingrained with much of our belief system, especially the Holy Bible. I do admit, I'm not wholly familiar with the book, but there is one story that has particularly stuck with me, and that is the role between good and evil, of God and his angel, Lucifer. Lucifer was struck down to Hell because he went against God, against authority, and by all accounts, good. In a way, I have always seen this as a larger theme, where good is associated with an adherence to authority, of obedience to law, where evil is often associated with everything that is the opposite - of stepping out of the lines, to question. I don't necessarily believe that there is any sort of natural right and wrong in nature, but I see these two elements - obedience vs. disobedience, predetermination vs. free will, black and white vs. shades of grey, as a permanent quandary that cannot, and will not ever be decided by any number of philosophers. As the Joker proves, one cannot exist without the other. As I learned in an ethics class in high school, one cannot know good without knowledge of evil. If one looks to any sort of politics in the world today, you will see that there is a division between left and right politics, because of the seating positions of an older government. In the United States, these divisions fall much along the same lines - the right is often a force for order, for adherence to principles, often along with religious support and faith, where the left is often represented by scientific reasoning and knowledge. Strictly speaking, this is a broad generalization, but you get my point. One of my favorite short videos that I've come across recently is 'Nemisis' a Norwegian (I think) short film that demonstrates this split nature between a hero and a villain. The protagonist, Arne, desires to be a hero, but alone, by himself, he is unable to become one without the antagonist, the Nemesis, as they find towards the end of the short film. Like many other stories, the heroes are often defined by what they are not, and oftentimes, villains are placed into the story with just these qualities, which will often boil down to these two extremes. This, I think, is why the comic books, and their stories, are so enduring in society, much like the Bible has remained for the thousands of years that Christianity has been around. The duel nature of good and bad, right and left, heads or tails, is a fundamental part of how we see the world, and the comic book format tells these stories in one of the most fundamental methods, a hero that represents one side, where the villain, who is just over the top enough to match the hero in this instance, represents the other. There is one movie that I can think of that does this in an even better fashion than the Dark Knight, in the same sort of genre, Unbreakable. The dominant theme here is once again, that of duality, and it incorporates the long history of comic books into this story, with the two characters as polar opposites. Where one was strong, the other was weak, and so on. One carried out crimes, where the other one sought to prevent them, a never-ending loop, a sort of natural balancing act that will continue to be examined, not only through the political, philosophical and religious realms, but also through that of the brightly colored panels of a comic book. I highly doubt that I will explore this sort of thing in my capstone paper, but there are elements of the Second World War that certainly applies, with the absolute evil that is represented by the Nazis that took over Europe, countered by the just cause of the Allied forces that took it back. I think that this balance is best represented by the introduction of Captain America in the late 1930s, with a dramatic punch to Hitler’s jaw on the cover of a comic book. In a way, without a presence such as Hitler, the very heroes that inspire and motivate us would have no reason to exist. Much is the same in today’s society with a group of costumed heroes. Without crime, they would have no reason to exist, however amusing their methods are. Heroes will always be balanced by a villain who represents everything that they are not, for good or for bad.